A lack of media coverage in both the U.S. and Canada has been instrumental in the decline in public awareness about the risks of climate change. VANCOUVER, Canada, Feb 21 2012 (IPS) - Amid revelations of a well-funded U.S. organisation’s plans to deliberately distort climate science, scientists and journalists at a major scientific conference called on the Canadian government to stop its muzzling of scientists. For the past four years, the Canadian government has been denying timely access to government scientists even when their findings are published in leading scientific journals, said scientists and journalists in a special session of the American Academy for the Advancement of Science meeting here in Vancouver, British Columbia. “The Canadian public doesn’t know as much as they could about science and climate change,” said Margaret Munro, who is a science writer for Postmedia News, based in Vancouver. “The more controversial the story, the less likely you are to talk to the scientists,” Munro told IPS. Last year, journalists from around the world were denied access to Canadian government scientist Kristi Miller, who had published a groundbreaking paper on the decline of salmon populations in western Canada in the journal Science. However, lobbyists for the oil and gas industry appear to have direct access to scientists, according to emails obtained under access to information legislation. Internal government documents reported an 80-percent decline in Canadian media coverage of climate change since 2007 when the new Stephen Harper Conservative government put restrictive policies into place. “It is unacceptable that the Canadian public sits back and allows access to the science they’re funding to be denied them,” said Andrew Weaver, a climate scientist at the University of Victoria. When the science community starts having “panels about the muzzling of scientists, you know the situation is pretty desperate,” Weaver said. Media provides the public with information so they can make informed decisions. But without timely access, the media cannot perform its role, he said. “When government muzzles scientists for political reasons, it cuts at the fundamental principals of good science,” said Stephen Hwang, professor of general internal medicine at the University of Toronto. “The open discussion of ideas is essential to science, just as a free press is essential to democracy,” Hwang said in a statement. The U.S. government has also controlled its own media’s access to scientists, especially under the George W. Bush administration. Many of those restrictive policies are still in place under the current administration, said Francesca Grifo of the Union of Concerned Scientists. But lobby groups in the U.S. face no such restrictions, and have been instrumental in the decline in awareness about the risks of climate change, various surveys have shown. In a January survey of the top 22 policy priorities for the U.S., the public ranked climate change dead last, according to the Pew Research Center. Confidential documents obtained last week from the Heartland Institute, a U.S. libertarian think tank, reveal a multi-million-dollar campaign to mislead the public about climate change and subvert government action to reduce greenhouse gas emissions. One project intended to undermine science lessons for schoolchildren. Heartland is also funding climate change contrarians in Canada and other countries, the documents reveal. Heartland has responded to this exposure with threats against media. On the weekend, it issued legal notices to websites and news organisations such as Canada’s “DeSmog Blog”, which broke the story, for “what it views as malicious and false commentary”. The notices demand the removal of alleged Heartland documents and any and all commentary. “‘Bad science and spin must be challenged more,” said European scientists here at AAAS as part a call for greater integrity, openness and clarity, and public engagement on complex issues of global significance. 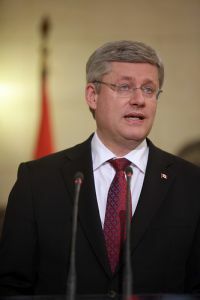 Despite promises of accountability and transparency, Canada’s government scientists remain “muzzled”, various media organisations including the World Federation of Science Journalists wrote in an open letter to Harper. The letter noted that efforts to resolve the issue have been ignored and now the only recourse is to draw public attention in Canada and around the world. Last December, the U.S. National Oceanic and Atmospheric Administration (NOAA) introduced a communication policy that allows scientists to freely speak to the media whenever they wish. Harper is being urged to adopt a similar policy for Canada’s government scientists. “Canadians have the right to… unfettered access to the expertise of publicly-funded scientists,” the letter concluded.